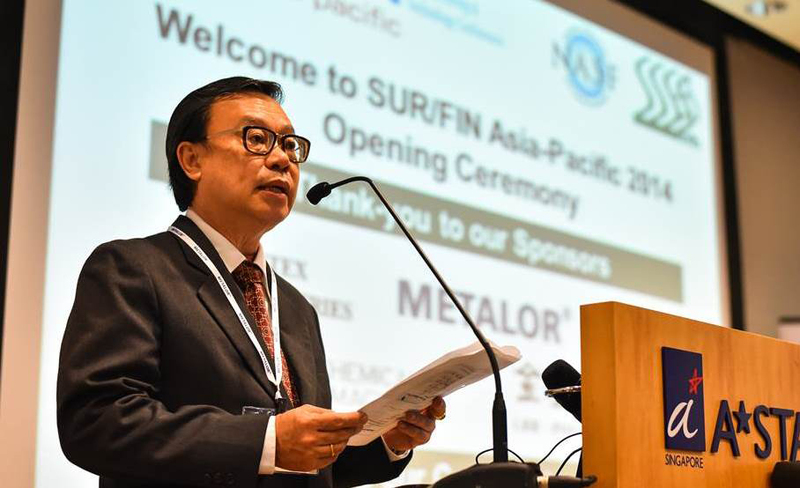 SUR/FIN Asia-Pacific is the only Southeast Asia event dedicated to the Surface Finishing, Surface Engineering, Surface Coating, Electroplating and Precision Engineering covering the full spectrum of industries located in Southeast Asia. Delegates please all be seated as we will begin on time at 09:00am. Immersed Electrochemical Modules in Plating Shops: Areas of Application and Technical Efficiency. Delegates please arrive by 08:45am as we will begin on time at 08:55am. Welcome all of you to our website and the coming SURFIN ASIA PACIFIC 2016 EXHIBITION & CONFERENCE to be held in Singapore at the Biopolis from 6th Dec to 8th Dec 2016. This bi annual exhibition and conference is jointly organized by National Association for Surface Finishers (NASF) of USA and Singapore Surface Engineering Association (SSEA) with the support of National University of Singapore (NUS) , Singapore Institute of Manufacturing Technology (SIMTech) and other organisation. We are indeed encouraged by the overwhelming success of the exhibitions and conferences held in 2012 and 2014, thank you for your support and we strongly recommend your participation in this upcoming 2016 event. For companies who are planning to expand into the South East Asia Region, this is the right exhibition for you to showcase your products and services. Singapore is well placed to serve as your Headquarter to penetrate to the fast growing region. So decide as soon as possible and register for a booth because we have limit numbers and selling fast. We are also looking at sponsors for the event and we look forward to your generosity. We are inviting technical papers to be presented at the conference and if you have any, please keep in touch with our relevant organizers. As a delegate, you can gain a lot of first hand knowledge by attending the exhibition and conference. So start registering now. All the information regarding the exhibition and conference is at your fingertips and just go to our website at www.aseansurfin.org and you are on your way to a fruitful exhibition and conference right here in YourSingapore! As a focal point for Southeast Asia Singapore attracts attendees from the entire region including Singapore, Malaysia, Vietnam, Thailand, Cambodia, Indonesia, India, Philippines, Myanmar and Laos. SUR/FIN Asia-Pacific 2012 attracted delegates and participants from 34 different countries worldwide. This finishing focussed event will attract attendees from the world`s leading surface finishing companies looking for solutions that will help them successfully create and deliver their products to market. Because Singapore plays a strong role in the trade architecture of Southeast Asia, customer enquiries and follow up visits can be made easily and cost effectively, with the right people, both before and after the event. Extensive networking opportunities will provide you maximum exposure to many potential customers. The accompanying technical conference will attract speakers, leading industrial and academic leaders as both speakers and delegates. Exhibitors and attendees alike will be able to choose from a key selection of training workshops and courses designed to upgrade their knowledge and skills thereby maximising their ROI. For additional exposure, exclusive sponsorship opportunities will be provided to widen participants` market exposure and create awareness of new product innovations.